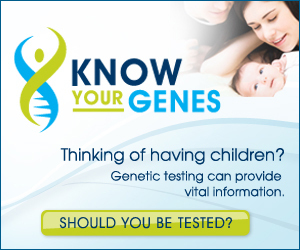 Know Your Genes is a public service provided by the Genetic Disease Foundation, a 501(c)(3) nonprofit foundation supporting research, education and the prevention of genetic diseases. The GDF relies on donations from individuals like you to be able to help educate people about genetic testing and genetic counseling options. Your contribution will directly support research for treatments and cures for genetic diseases and education programs like Know Your Genes that help prevent genetic disease. To donate using Google's secure Checkout service enter an amount below and click the Donate button. Google Checkout accepts all major credit cards. If you would prefer to donate via Paypal or direct bank account transfer please click the Donate button below. To donate to the Genetic Disease Foundation by phone please call 212-659-6704. Right-click (contrl-click on a Mac) on a banner below to download to your computer.